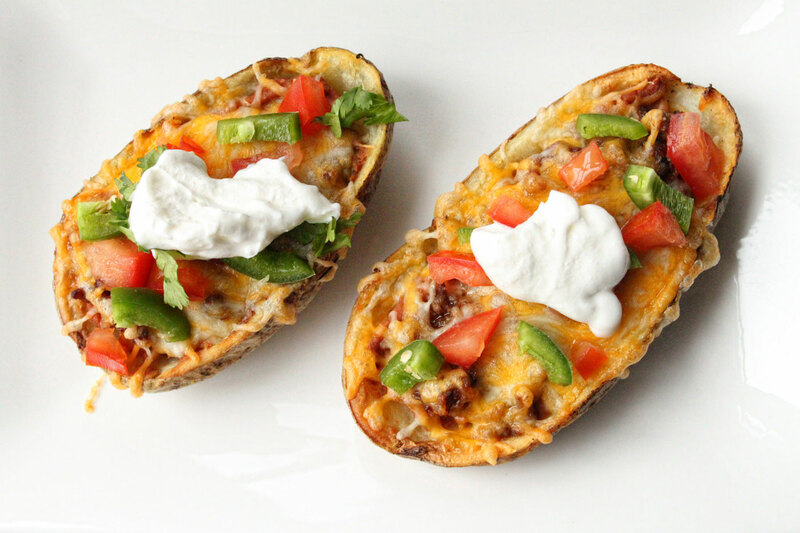 If you have been following my site for any time, you will know that my loaded potato skins are a big hit with many folks. It’s obvious in what user pin, and comment on. I mean who doesn’t love a great potato skin, right? I love them so much that they have their own category on my site, as well as their own website at http://www.bakedpotatoskins.com/ that’s how much I love them. Recently, I have been thinking of all of the great Tex-Mex I had while living in Dallas, Texas. There was a restaurant right down the street from my first job called Chuy’s. The place was dangerous. I say that because I probably ate there once a week, and the plates were loaded with great beans, rice, and things like enchiladas, burritos, and chimichangas. It was Tex-Mex heaven. With that said, I have been craving Tex-Mex food, and upon looking around my kitchen, I had some of the basic ingredients, but I was dying to use up the leftovers from the nacho night a couple of days ago. 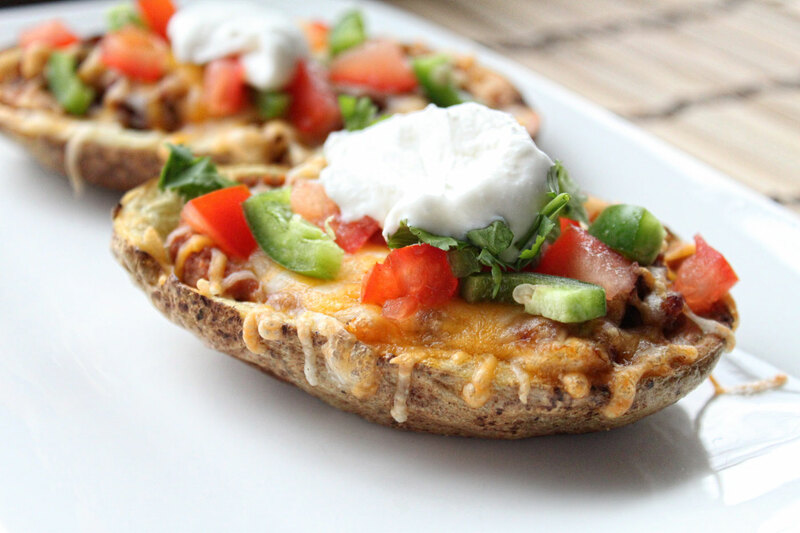 This is when the light sparked, and why I decided to come up with these Tex-Mex potato skins. They were heavenly. To a skillet, add in the cooked ground beef, the enchilada sauce, and the onion. Cook for about 5 minutes on medium heat until the sauce comes to a slow boil and the onion softens. Place them under the broiler for 8-10 minutes until the insides get a bit crispy from the melted butter. Remove, then fill each potato skin with a layer of refried beans. Top the beans with the meat mixture and then top each one with cheese. Place these back into the oven, and cook until the cheese is nice and melted. Remove, and top with the diced tomatoes, jalapeno, avocado, and cilantro. Top each with a dollop of sour cream, and then go to town. 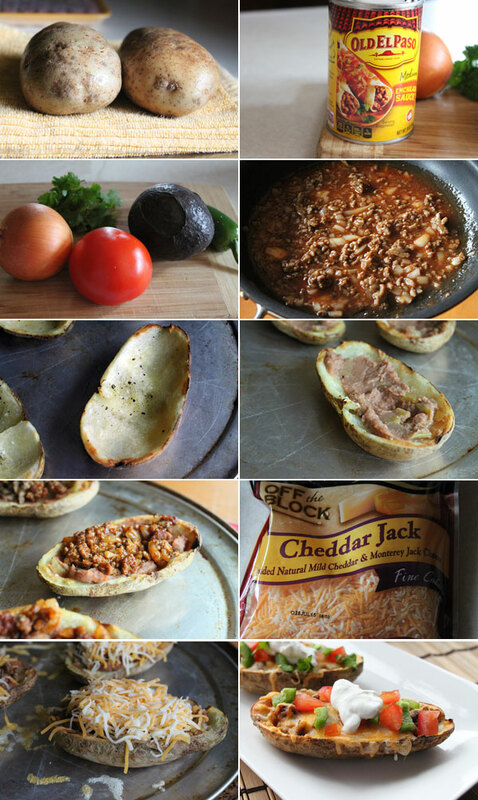 Now did these Tex-Mex potato skins satisfy my craving for Tex-Mex food? Absolutely. They were awesome, and what’s not to love when you get everything you love in a couple of bites! Not only that, but I was able to use my leftovers, which I am a total fan of transforming those into something playful. If you ever get that craving like I did, give these a shot and let me know what you think. Did I mention these are totally worth making for any game day event? I love a good stuffed potato skin too. Never tried a tex mex flavoured one before though – I definitely have to make these!